One strategy being tried is checkpoints. Israeli forces have shut down access to some Palestinian neighborhoods in east Jerusalem by setting up checkpoints and putting more police on the streets. “These police actions and operations are intended to fairly respond to the wave of terror and knifing, within the framework of trying to return law and order to all citizens of the state,” police spokeswoman Luba Samri said. Human Rights Watch condemned the new security measures. “Locking down east Jerusalem neighborhoods will infringe upon the freedom of movement of all Palestinian residents rather than being a narrowly tailored response to a specific concern,” said Sari Bashi of Human Rights Watch. #Jerusalem mayor’s call to close Palestinian neighborhoods- punitive, disproportionate response to tough security problem. Attacks are real challenge for Jerusalem police. But closing off Palestinian neighborhoods blocks freedom of movement of all residents. 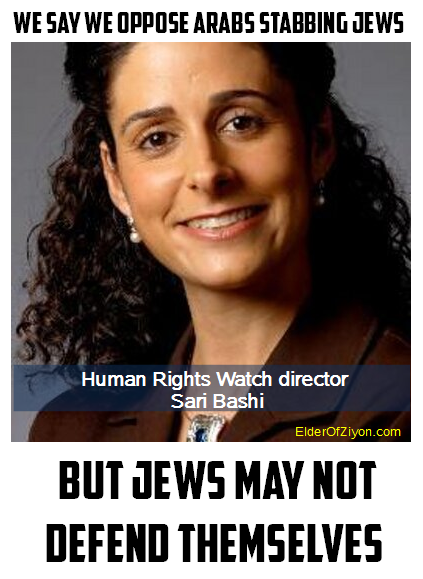 Bashi is admitting that Human Rights Watch cannot come up with a single idea of how Israel can defend Israelis from being stabbed by random Arabs. But HRW’s official position is that dead Jews are a small price to pay to avoid inconveniencing the people from whose neighborhoods the murderers come. Meaning that given a choice of the rights of Jews to live, or the rights of Arabs to not have to spend an extra couple of minutes to go somewhere, the Arab rights win. Given the choice of an admittedly imperfect disincentive for young Palestinians to stab Jews, and allowing Jews to be stabbed, HRW chooses to let the Jews die. It isn’t a question of human rights for Palestinians. It is a question of competing human rights between two groups of people – one of which, by and large, wants to see the other dead. But in the twisted calculus of HRW, Arab rights to move freely (a right that Jews do not have either in Israel) are far, far more important than the right for Jews to live. Which is a curious position for a supposed “human rights” group to take. I should note that to my knowledge, HRW has never said a word against constant Arab incitement to kill Jews or Arab antisemitism or Arab officials justifying the murder spree. They claim that they are against the stabbings but in practical terms, HRW supports them. Their pretense of caring about Jewish lives is never backed up by any concrete call for action on the parts of those who call the murderers heroes and martyrs.